His black cap appears to be a Monmouth knit cap, and it sits atop shoulder length hair hanging loose. The sailor's position does not allow us to see his lapels and collar (or lack thereof), presence or absence of pockets on the jacket, neck cloth, and a number of other details. What we can see is an unusual backside view of his trousers and jacket. The jacket is definitely without vents, but hangs too low for us to see the style of tie (if any) at the back of his white trousers. Interestingly, this sailor is without stockings, the first image in our examination to be so. It is likely that in practice many more sailors went without stockings, but most images don't show this. We cannot see the toes of his shoes in this image, but we can see the square shoe buckles. EDIT: It has just been pointed out to me by Adam Hodges-LeClaire that there is a second sailor in this image! 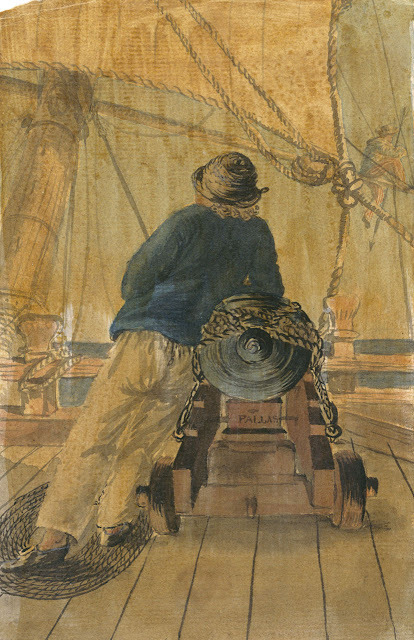 Sitting astride the yardarm in the upper right background of the image is a tar with what appears to be a harpoon. He wears a round hat with a fairly cylindrical but flat topped crown. His jacket is blue, but there really isn't enough detail to say more than that. The trousers decorated with narrow red stripes are quite interesting, as I believe they are the only pair depicted in any of Bray's works. As Buzz Mooney stated, this is not a shore-going rig. Most images of sailors, and virtually all of them that feature striped trousers, are created by artists ashore who depict sailors in what artists would have seen of them: a short-going set of slop clothes. 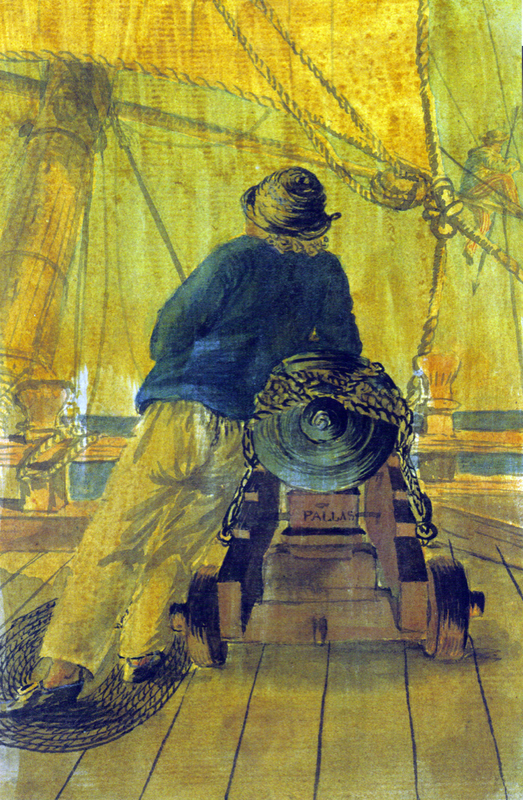 This image is atypical of images of sailors at sea, and demonstrates that at least this tar was wearing his striped trousers while aboard.